"Open licence" redirects here. For the French licence, see Open licence (French). 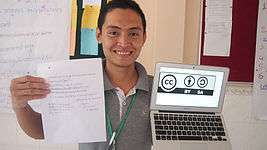 The logo on the screen in the subject's left hand is a Creative Commons license, while the paper in his right hand explains that the image is open content. Open content is a neologism coined by David Wiley in 1998 which describes a creative work that others can copy or modify. The term evokes the related concept of open source software. Originally, the Open content concept and term was evangelized via the Open Content Project by David A. Wiley in 1998, and described works licensed under the Open Content License (a non-free share-alike license, see 'Free content' below) and other works licensed under similar terms. It has since come to describe a broader class of content without conventional copyright restrictions. The openness of content can be assessed under the '5Rs Framework' based on the extent to which it can be reused, revised, remixed and redistributed by members of the public without violating copyright law. Unlike open source and free content, there is no clear threshold that a work must reach to qualify as 'open content'. Although open content has been described as a counterbalance to copyright, open content licenses rely on a copyright holder's power to license their work, similarly as copyleft which also utilizes copyright for such a purpose. In 2003 announced Wiley that the Open Content Project has been succeeded by Creative Commons and their licenses, where he joined as "Director of Educational Licenses". In 2006 the Creative Commons' successor project was the Definition of Free Cultural Works for free content, put forth by Erik Möller, Richard Stallman, Lawrence Lessig, Benjamin Mako Hill, Angela Beesley, and others. The Definition of Free Cultural Works is used by the Wikimedia Foundation. In 2008, the Attribution and Attribution-ShareAlike Creative Commons licenses were marked as "Approved for Free Cultural Works" among other licenses. Another successor project is the Open Knowledge Foundation (OKF), founded by Rufus Pollock in Cambridge, UK in 2004 as a global non-profit network to promote and share open content and data. In 2007 the Open Knowledge Foundation gave a Open Knowledge Definition for "Content such as music, films, books; Data be it scientific, historical, geographic or otherwise; Government and other administrative information". In October 2014 with version 2.0 Open Works and Open Licenses were defined and "open" is described as synonymous to the definitions of open/free in the Open Source Definition, the Free Software Definition and the Definition of Free Cultural Works. A distinct difference is the focus given to the public domain and that it focuses also on the accessibility ("Open access") and the readability ("open formats"). Among several conformant licenses, six are recommended, three own (Open Data Commons Public Domain Dedication and Licence (PDDL), Open Data Commons Attribution License (ODC-BY), Open Data Commons Open Database License (ODbL)) and the CC BY, CC BY-SA, and CC0 creative commons licenses. The OpenContent website once defined OpenContent as 'freely available for modification, use and redistribution under a license similar to those used by the Open Source / Free Software community'. However, such a definition would exclude the Open Content License (OPL) because that license forbade charging 'a fee for the [OpenContent] itself', a right required by free and open source software licenses. The term since shifted in meaning. OpenContent "is licensed in a manner that provides users with free and perpetual permission to engage in the 5R activities." This broader definition distinguishes open content from open source software, since the latter must be available for commercial use by the public. However, it is similar to several definitions for open educational resources, which include resources under noncommercial and verbatim licenses. The later Open Definition by the Open Knowledge Foundation define open knowledge with open content and open data as sub-elements and draws heavily on the Open Source Definition; it preserves the limited sense of open content as free content, unifying both. "Open access" refers to toll-free or gratis access to content, consisting mainly of published peer-reviewed scholarly journal articles. Some open access works are also licensed for reuse and redistribution, which would qualify them as open content. Over the past decade, open content has been used to develop alternative routes towards higher education. Traditional universities are expensive, and their tuition rates are increasing. Open content allows a free way of obtaining higher education that is "focused on collective knowledge and the sharing and reuse of learning and scholarly content." There are multiple projects and organizations that promote learning through open content, including OpenCourseWare Initiative, The Saylor Foundation and Khan Academy. Some universities, like MIT, Yale, and Tufts are making their courses freely available on the internet. ↑ Grossman, Lev (1998-07-18). "New Free License to Cover Content Online". Netly News. Archived from the original on 2000-06-19. Retrieved 2010-01-12. 1 2 3 Wiley, David (1998). "Open Content". OpenContent.org. Archived from the original on 1999-01-28. Retrieved 2012-04-17. 1 2 3 4 Wiley, David. "Open Content". OpenContent.org. Retrieved 2011-11-18. ↑ "Lawrence Liang, "Free/Open Source Software Open Content", ''Asia-Pacific Development Information Programme: e-Primers on Free/Open Source Software'', United Nations Development Programme – Asia-Pacific Development Information Programme, 2007." (PDF). Retrieved 2012-06-23. ↑ "Revision history of "Definition" - Definition of Free Cultural Works". Freedomdefined.org. Retrieved 2012-11-14. 1 2 3 "History - Definition of Free Cultural Works". Freedomdefined.org. Retrieved 2012-11-14. ↑ "Resolution:Licensing policy". Wikimedia Foundation. Retrieved 2012-11-14. ↑ "Approved for Free Cultural Works". Creative Commons. 2009-07-24. Retrieved 2012-11-14. ↑ Davies, Tim (12 April 2014). "Data, information, knowledge and power – exploring Open Knowledge's new core purpose". Tim's Blog. Retrieved 25 October 2015. ↑ "Open Knowledge Foundation launched". Open Knowledge Foundation Weblog. Retrieved 25 October 2015. ↑ "Open Knowledge: About". okfn.org. Retrieved 25 October 2015. ↑ Atkins, Daniel E.; John Seely Brown; Allen L. Hammond (February 2007). A Review of the Open Educational Resources (OER) Movement: Achievements, Challenges, and New Opportunities (PDF). Menlo Park, CA: The William and Flora Hewlett Foundation. p. 4. Retrieved 2010-12-03. ↑ Geser, Guntram (January 2007). Open Educational Practices and Resources. OLCOS Roadmap 2012. Salzburg, Austria: Salzburg Research, EduMedia Group. p. 20. Retrieved 2010-11-06. ↑ "Open Definition". OpenDefinition.org. Retrieved 2011-11-18. ↑ Kantrowitz, Mark (2012). "Tuition Inflation". FinAid.org. Retrieved 2012-04-18. ↑ NMC (2012). "One Year or Less: Open Content". 2010 Horizon Report. Retrieved 2012-04-18. ↑ Admin (2012). "Open.edu: Top 50 University Open Courseware Collections". DIY Learning. Retrieved 2012-04-18. 1 2 Fitzgerald, Bill (2012). "Using Open Content To Drive Educational Change". Funny Monkey. Retrieved 2012-04-18. ↑ Moushon, James (2012). "e-Textbooks: How do they stack up against tradition textbooks". Self Publishing Review. Retrieved 2012-04-18. Wikimedia Commons has media related to Open content.